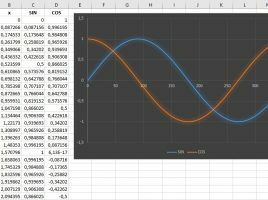 If you are someone who likes mathematics it will be useful for you to know that Excel has a lot of trigonometric functions, and we can use them whenever is necessary to plot your sinusoids. These are the functions of SIN (sine), COS (cosine), TAN (tangent), COT (cotangent), and there are many others as well. 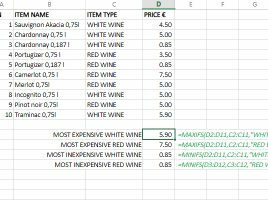 If you are curious you can easily find them in the Excel function library. How to draw a sinusoid? 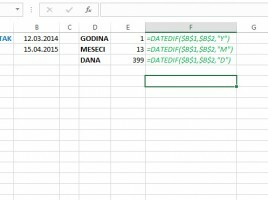 Excel that comes with Office365 brings two new logical functions: IFS and SWITCH. The first of them consists of a number of conditions, and returns the selected value after the first fulfilled condition. The other starts with a condition, and then, depending on the values ​​that meet the requirement returns appropriate value. Sometimes these functions can be very useful, and how to use them I’ll show in following recipe. 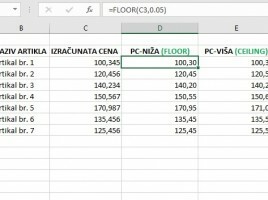 One of the updates of the Office365 package, within Excel 2016, has brought functions for conditional aggregation of data that find the minimum or maximum values ​​of the range depending on the given conditions. These are the functions MINIFS and MAXIFS, and in the following text I will show you how to use such functions. Rounding functions are approximating numbers to higher or lower values. On that occasion, they are guided by mathematical principles. 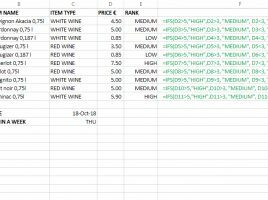 However, when pricing is often required, rounding is done at a higher or lower level according to a given degree of significance, which is the decimal number in relation to which the rounding is done. Dear merchants (and everyone else), we present you functions FLOOR and CEILING!